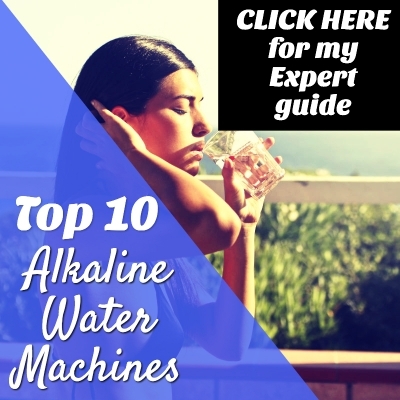 H ello everyone and welcome to Alkaline Water Machine source, your #1 resource for alkaline water product reviews and information about the growing alkaline lifestyle that’s helping people heal around the world. You are about to read my Aqua Ionizer Deluxe 5.0 Review. I previously reviewed the Aqua Ionizer Deluxe 7.0 and Aqua Ionizer Deluxe 9.0. You can check either of those reviews if you want first by clicking the blue links above. If not, feel free to dive right into my review for the 5.0 unit. The Aqua 5.0 unit is the lowest price of the three units produced by Air Water Life, but it still packs a punch. Air Water Life produces some of the most affordable alkaline water machines in the world, and there are a ton of positive reviews on their products. That’s why I recommend their products to all serious buyers who want a unit that will last a lifetime. The Deluxe 5.0 could be the perfect unit for you. It’s surely a great first alkaline water machine for your home, and it comes at a bargain price. What are people saying about the Aqua Ionizer Deluxe 5.0? I begin my review by listing the features of the Deluxe 5.0 (AWL-5000) model. When purchasing an alkaline ionizer, you should always consider the number of titanium plates, number of filters, filter life, number of alkaline settings, and whether the unit can be installed under the sink. First, I will go over the warranty. Air Water Life has updated its warranty program. All units produced by Air Water Life now have a limited lifetime warranty. To make a long story short, if anything goes wrong in the first five years, Air Water Life will replace or repair the unit free of charge. After five years, the owner pays for the labor and parts for all repairs. In my opinion, this is the best warranty program available. The Aqua 5.0’s LCD display is the least attractive of the bunch. The Aqua 7.0 and 9.0 both have more beautiful LCD panels, but the 5.0 does have all the same settings as its more expensive counterparts. Below you can check out a photo, or if you’re using a desktop, you can see the 5.0 unit in the sidebar. Feel free to click on the sidebar image to see more photos. Each of Air Water Life’s units is named after the number of Vanguard platinum coated titanium plates inside the unit. The plates are what make the alkalizing magic happen after the water is filtered. The 5.0 unit has five plates while the 7.0 has 7, and the 9.0 has 9. The plates in the 5.0 have a total surface area of 81.8 square inches. All Air Water Life’s units have one built-in activated carbon filter that can easily be changed once per year or less. The 5.0 unit can filter over 1,050 gallons before it needs a filter change. The unit comes with the first filter, no need to worry about purchasing a separate filter. The Aqua Ionizer Deluxe 5.0 makes water with a pH range of 4.5 to 11. This is slightly less than the 7.0 and 9.0, but you most likely won’t need to make water with a pH higher than 11. The best pH range for experiencing alkaline water benefits is between 8 and 9. The ORP Range is +600.00 to -600.00mV. The ORP measures the antioxidant value of the water you drink from the machine. The lower the number, the more antioxidant power that’s in the water. 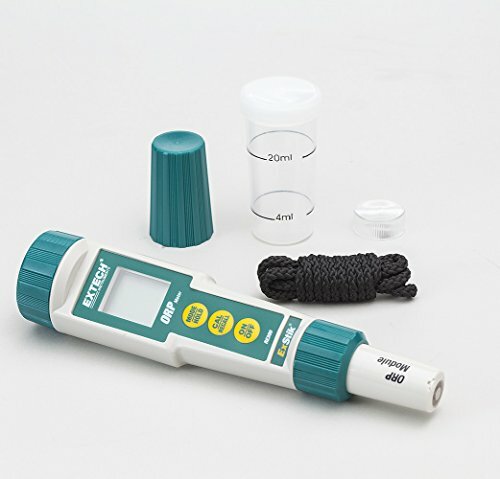 You can buy your own ORP meter to make sure the water is providing anti-aging antioxidants. The machine’s universal faucet adaptor fits almost all “pull out” and “sprayer” style sink fixtures. You can install it virtually anywhere in your home, including the bathroom. All of Air Water Life’s ionizers can be installed on the countertop or under the sink. Installation only takes about ten minutes with the universal sink adaptor. Most people prefer to install on the countertop to be able to easily view the LCD panel. Please be advised that the 5.0 unit says it does not work with well water, but users say they are using well water without any problems. The Deluxe 5.0 only uses FDA approved and BPA-free plastic parts, and the units are manufactured in an ISO-certified facility. The 5.0’s dimensions are 8.3″ Length x 4.3″ Width x 13″ Height. 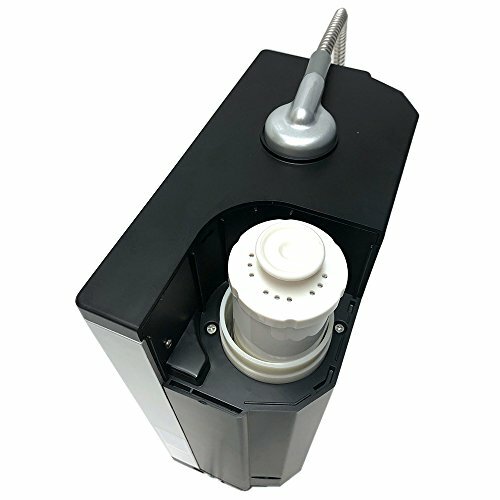 There’s no need to worry about opening up the ionizer to clean it. It features a self-cleaning system that turns on when you turn the unit on and when you turn it off. It also switches polarity every fifteen minutes of continuous use to extend the life of the titanium plates. The Aqua Ionizer Deluxe 5.0 weighs just 8 pounds, which is lighter than both the 7.0 and 9.0. The 5.0 makes water that is RoHS certified to be 100% lead-free. Users reported a flow rate of one gallon per minute. International users must keep in mind that the 5.0 is 110v only. This does not affect anyone living in the U.S. The LCD panel features 7 different water settings: 4 alkaline “wellness” levels, 2 acid “cosmetic” water levels, and 1 pH neutral purified drinking water. The Deluxe 5.0 is installed in the same way as the 7.0 and 9.0 models. Mostly everyone reports an amazingly simple installation process. The best part is you can start drinking the alkaline ionized water from the machine just minutes after you finish installing it! No need to waste time flushing the filter. You and your family can begin your healing journey the same day you install it. It should only take about 10 minutes to get the unit up and running. Where will you install your new alkaline water machine? All of Air Water Life’s water ionizers have an amazing filter life. You won’t need to worry about buying filters every couple of months. That would be a dealbreaker for me. That’s why I love the modern alkaline water machines because we only need to buy one filter per year. Each activated carbon filter costs less than $50 and will last you a year! After the initial investment in the alkaline water machine, you only pay $50 per year for over 1,050 gallons of alkaline ionized water. That’s less than 5 cents per gallon. Imagine all the money you will save in the long run while you provide your family with the best alkaline water for their health. A lot of people report less sickness in the family during the year, which equals big savings in medical costs. Now, let’s jump into the fun part. What are the advantages of owning the 5.0 unit? Let’s go over all the pros and cons, plus the things you should consider when you purchase your new alkaline water machine. One woman and her husband are “impressed” by the quality of the customer service. She said that she’s been able to call customer service without any problems and friendly people are always on the other end. One person reported receiving a bad seal. The seller responded by sending 3 new seals and a free filter. The owner was “impressed” by the company and reported having no problems after. The same person also complimented the “nice music” that plays while the unit cleans itself. 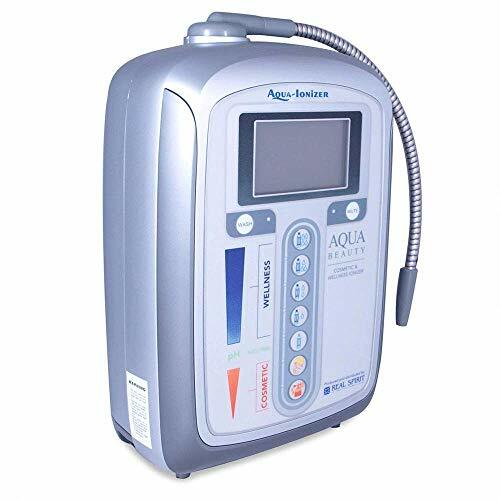 One man is happy with his purchase of the Aqua Deluxe 5.0 after trying the much more expensive Kangen machine for 30 days. He saved $3,400 by buying the Aqua Deluxe 5.0 instead, and he’s loving his decision. Everyone is complimenting the politeness of Mason and David, who are the two people you will talk to when you have any questions. Another woman is impressed by how simple the unit is to use and install. She also likes how quiet it is. Some users reported the importance of having good water pressure to get the most out of the machine. Now for my favorite part, health benefits. I always love to read and share all the healing stories I come across while doing my research for you. One man is excited about no more joint inflammation and quicker recovery after working out. Lactic acid in the muscles is the main reason you feel sore after working out, so it only makes sense that alkaline water neutralizes the acidity. No swelling in two surgically repaired knees after running. A lot of people are saying that alkaline water makes their dogs healthier. One dog owner said he and his 12-year-old dog are both happy with the alkaline water. A cat owner said his cats drink the alkaline water for a minute straight, and he’s “never seen anything like it.” Before, they refused to drink the tap water. Animals know best. One man reported that he and his wife healed from stomach acid problems after drinking high alkaline water for two weeks. One man from Trinidad was very happy with his purchase and thinks it was a good investment in his health even after the import fees. The verified 5-star reviews of the Aqua Deluxe 5.0 ionizer are nearly 80% of all reviews. This is an incredible number. In my opinion, the 5.0 unit could be the best purchase of all Air Water Life’s units as long as you have good water pressure. When you buy the 5.0 unit, you only pay just over $500 and get free shipping with a lifetime warranty. The 5.0 unit is a no-brainer. You get a premium machine without the premium price tag. The fact that a man who tried the $4,000 Kangen liked the 5.0 just as much is enough to convince me that the 5.0 is a solid purchase.